He urged residents to take care of what they needed before a curfew kicks in at 10 a.m. on Tuesday. The storm is expected to be a category four when it passes a few miles south of St. Croix. He said high winds are expected to hit St. Croix by 2 p.m. Tuesday. Although the winds might never reach above tropical storm force on St. Thomas and St. John, Mapp cautioned, “This is a live animal, do not take any comfort.” Any wobble north of the storm path could bring St. Croix into the eye of the hurricane and take hurricane force winds to St. Thomas and St. John whose residents are still recovering from the blow given to them last week when Hurricane Irma ploughed through. Residents appear to be taking the storm predictions seriously as it was reported that the shelter at Lockhart Elementary School was already filled Monday afternoon. Other shelters on St. Thomas for Maria are at Knud Hansen hospital and Bertha C Boschulte Elementary School. On St. Croix, the shelters are at Canegata Park, Herbert Grigg Home and the St. Croix Educational Complex. The St. John shelters are at Guy Benjamin Oliver School and Bethany Moravian Church. The winds are expected to be hurricane force on St. Croix around midnight. Those winds on St. Croix could reach 130 miles per hour, according to Mapp. He said they would peak at about 4 a.m. Rain is expected to be 12 to 18 inches on St. Croix and six to 12 inches on St. Thomas during the storm and the rain could continue through the week. Delroy Richards, the Virgin Islands police commissioner, said the curfew beginning 10 a.m. Tuesday would be strictly enforced. He stated that in recent days residents have challenged officers enforcing the curfew and that was when they were arrested. Mapp said that WAPA (the Water and Power Authority) will try to keep power going on St. Croix until 2 p.m. Tuesday, then cut it off to safeguard the system. Seaports of the territory will be closed at 8 a.m. Tuesday. 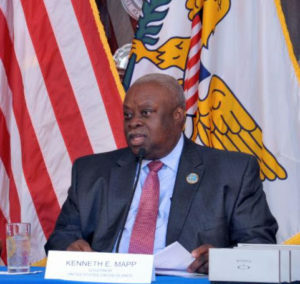 Mapp urged people not to ride the storm out on boats. Mapp said that damage from these storms may top the $3.6 billion cost of Hugo in 1989. Mapp said at the Monday afternoon briefing that there might be an exodus of residents from the territory. He also apologized, during the early afternoon briefing, for government officials who thought since the National Guard and police officers were present at the Tutu high-rise public housing facility being evacuated, that it would be a good time to issue eviction notices. He said that action was highly insensitive and immediately stopped. To apply for individual assistance, residents should visit www.disasterassistance.gov or call 1-800-621-3362.